It's Monday! The perfect day to start eating healthier. 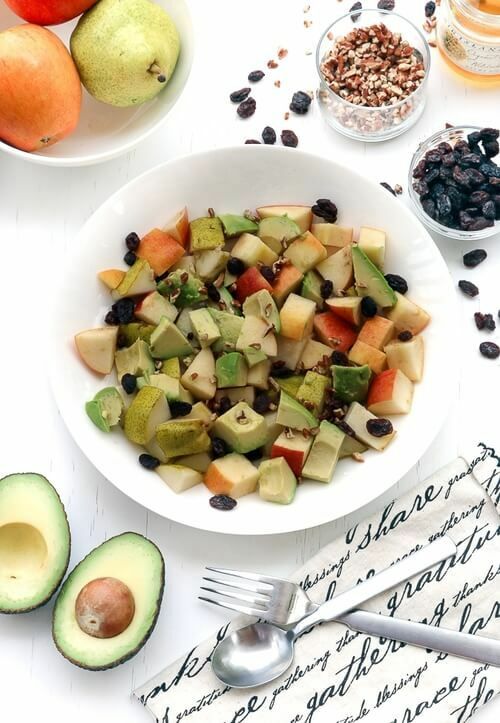 This warm fruit pecan avocado raisin salad is food for your brain. We all know avocado is great and packed with great nutrition, and an apple a day could keep the doctor away, but what about the pear? The low-calorie mild sweet fruit is packed with fiber and antioxidants. Pears can help you with weight-loss and reduce the risk of diabetes, heart disease and cancer. So start incorporating some pears into your diet. And this warm sweet salad can help you do just that! It will satisfy your sweet cravings and help you focus. In a saucepan heat up 2 Tablespoons water. Chop 1 pear and 1 apple into bite size pieces and add fruit to saucepan. Stir on low heat for 3 minutes. Transfer fruit to a serving plate. Chop 1 avocado and mix in with fruit. Sweet dressing: Whisk together 1 1/2 Tablespoons honey, 1 teaspoon vanilla, and 1/8 teaspoon cinnamon. Drizzle on fruit. Sprinkle 1 Tablespoon raisins and 1 Tablespoon chopped pecans. Enjoy!